Family owned and operated for more than a hundred years, Bertazzoni embraces their Italian heritage, offering big, colorful cooking appliances in the spirit of Italian cooking, but with the designer flair of the Milan auto industry. Their selection of kitchen ranges, ovens, cooktops, and range hoods are made to the highest professional standards, with precise temperature controls, environmentally friendly design… and the capacity to cook a big meal for a big family. Born in the Parma region of Italy, Bertazzoni still holds true to its roots, drawing aesthetic influences from the bright, bold colors of Italy and the modern automobile and design industries of Milan. 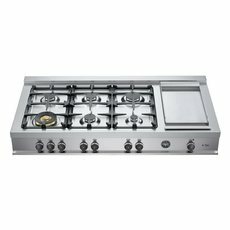 Bertazzoni is dedicated to quality first, but design comes a close second, combining colorful finishes with modern industrial chrome detailing. Their appliances also utilize much of the same beautiful, user-friendly technology used in other industries in the region, to make for a smooth and intuitive user interface. 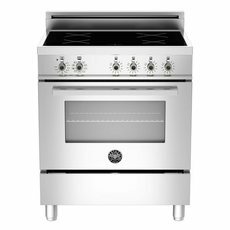 One of the first companies to make the leap from wood burning stoves to gas powered ones, Bertazzoni is still at the forefront of the technology, with professional quality gas cooktops that offer best-in-class heating times, amazingly responsive controls, and sealed burners that are easy to clean and allow for the use of any kind of cookware. If you dream of cooking like a pro, Bertazzoni ranges offer that dream come true. Though the bulk of Bertazzoni´s products are based in tradition, their induction cooktops are nothing if not futuristic. 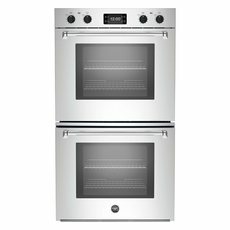 Supremely energy efficient and much more kid-friendly than either gas or electric stoves, induction cooktops use an electric current to transfer heat directly into your cookware, with no heat lost, no hot burners, and precise, responsive temperature controls that even rival their gas ranges. Bertazzoni´s ovens are incredibly versatile, offering not only your typical convection cooking, but non-convection, combined convection and grilling, low temperature proofing, warming, and even slow cooking options. They provide even, all around heating, precise temperature control, and are designed to be highly insulated and energy efficient. 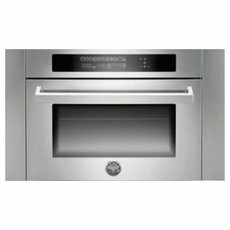 Plus, they´re sized to accommodate standard catering dishes, and can handle cooking multiple dishes at the same time. 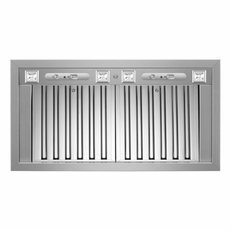 So whether you´re a professional chef or tend to cook for a crowd, a Bertazzoni oven can actually replace most of the cooking appliances in your home. Nearly all of Bertazzoni´s products come with intuitive digital touch controls, which allow you to control the temperature of your appliance, whether it´s a gas range, electric oven, or induction cooktop. All of their appliances are both precise and responsive, meaning that you´ll get exactly the temperature you desire within a matter of moments. Their ovens even allow you to save specific heat, time, and cooking type settings for one-touch setup for your favorite recipes. Bertazzoni is dedicated to the environment from the ground up. Their production plant in Italy recycles and reuses materials, and reduces pollution and energy consumption in production. They design products to be as energy efficient as possible, using less gas or electricity and are all thoroughly insulated to prevent heat loss. 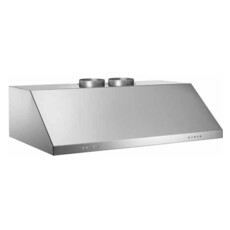 Plus, their ranges, cooktops, and accessories are made almost entirely of stainless steel, with very few plastic parts. Their whole range of cooking products is 99% recyclable, so even once the usable life of your appliance is over, it can be completely broken down and reused.